Ice cream brand Ben and Jerry’s has taken to sending personalised tubs to promote its new €10,000 ‘Join Our Core‘ hunt for the next sustainable business leaders. 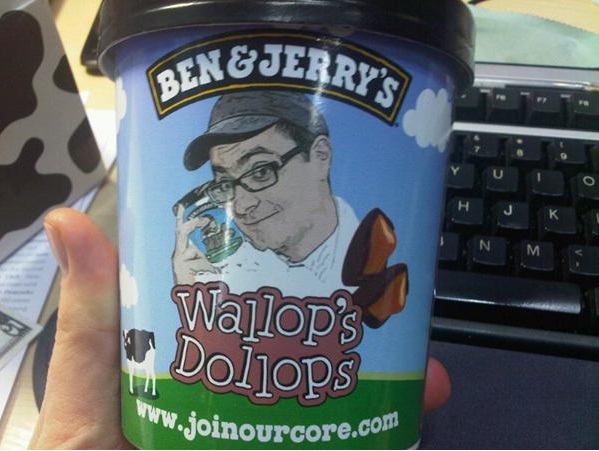 Ben and Jerry’s has tweeted to say they’ve sent others personalised tubs, too, so I hope to update with more pictures of as and when they crop up. Thanks to Sticky Eyes’ Lisa Wisniowski for tweeting with it! Hmmm… Lucky I’m not a prominant journo. Tricky to find an appetising flavour that rhymes with ‘Cavaiuolo’.